Crystals are exposed to earth’s energies including magnetic and electric energy fields. Crystals live and, like us, absorb energies from around them. Different ways they absorb include lightning, pollution, natural disasters, the positioning of the planets, and from other people. Crystals attract both positive and negative energy from things around them, especially if they are in direct contact with them. Not only do we, ourselves give off energy, but we absorb it directly from crystals. If a crystal is holding a lot of negative energy we will absorb it. For this reason, we need to cleanse our crystals, both to get rid of what was there before and to empty it from any mean-nasties we or people around us have given off. 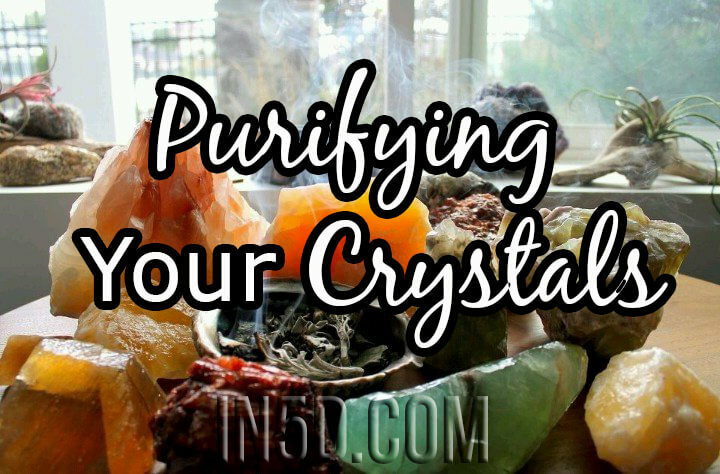 Before cleansing your crystal’s energy, be sure to physically clean it. I like to think of it this way- if you are sick you can sleep all week and take as much medicine as you want but until you have a shower or bath, you are still going to feel plugged up and junky. To physically clean your crystals, visit this page for a how to depending on the hardness of your particular crystal. Sun and moon– place them in a place where the crystal can be fully exposed to the rays of the sun and leave them for 24 hours. The moon, while not as powerful as the sun, (unless it is a full moon) will still help cleanse the crystal. Earth– you have the option of burying them. I, personally, have not done this because I am way too attached to my crystals to risk having squirrels or something come dig them up during the night. But if you or your crystals are earthbound spirits then this might work best for you! Simply place them in a little fabric bag (the more natural the fabric the better) and find a nice spot of soil that hasn’t been tainted by pesticides or fertilizers. Moving water– If you have access to a clean creek or river set them in the water in a safe place where they cannot get swept away and let the clean water flow over them for a few hours. After some time has passed, collect them and let them air dry in the sun. Rice– If you live in a very urban city with limited space and smog, this might be a great option for you. Simply place your crystals in a bed of rice overnight. Rice absorbs negative energy and can be reused for future crystal cleansing. Sage- I don’t care much for this technique because it gets the crystals dirty but a lot of people love it. Bind and light the end of your sage on fire. Blow out the flame and let the sage smoke. Wave the sage around the crystals allowing them to be enveloped in smoke and rub the sage ash on the crystals. Feel free to rub it on yourself as well. If you have just bought a crystal, be sure to clean it first and then handle it. Crystals bind themselves to their owners so it is best to start off clean and fresh. You don’t want to pick up and negative energies that were left over from the previous owner. Also see: Now That I Have My Crystals, What Do I Do With Them? Also, as much as you think you might be helping, do not share your crystals with friends. Crystals form a very personal attachment to their people and the results of sharing could be less than desirable for both you and your friend. May your crystal and your spirits stay pure! Rachael Avery is an aspiring writer from Boise, Idaho. She does acroyoga and is a lover of crystals. Her favorite crystal is the amethyst.